This is a guest post by Abby Jarvis, Communications Coordinator for Qgiv. Among the buzzwords that dominate nonprofit fundraising conversations, “crowdfunding” and “peer-to-peer fundraising” are two of the most common. It seems like every conference, summit, or seminar focuses — at least in part — on how nonprofits can use crowdfunding and peer-to-peer funding to support their work. But you might be wondering what exactly the difference is, and how your organization can leverage either most effectively. Ready to learn how you can use either or both to your advantage? Let’s dive in! If you’ve ever funded an invention on Kickstarter or donated toward someone’s healthcare bills on GoFundMe, you’ve participated in a crowdfunding campaign. It has grown increasingly popular over the last few years, and people have used it to raise money for everything from movie productions to dream vacations. Campaigns typically have a set fundraising goal, and progress is tracked using a single progress bar. As a general rule, crowdfunding campaigns focus on creating viral campaigns that attract many small donations. The organization running a campaign — in this case, a nonprofit — is the primary driver of all promotion and activities associated with the fundraiser. Donors are invited to share the campaign to their friends and family, but they’re not personally involved in the fundraiser outside of sharing the page once or twice. Most crowdfunding campaigns are centred on raising money for a single particular program or major purchase. In the nonprofit world, it’s a useful fundraising style if you want to do something like build an addition to your facility or purchase new computers for your classroom. If you decide to launch a crowdfunding campaign, expect to work hard to build momentum and visibility for your campaign. You’re going to be the driving force behind this campaign’s success. Still wondering when crowdfunding can give you a boost? Here are three scenarios that will help you run the best crowdfunding campaign possible. Crowdfunding will be your best bet if you’re looking to raise money for a one-off purchase or expense. It’s also a good option if you’ve got a large audience of engaged followers on your social media channels. You’ll want to make sure your audience sees your crowdfunding page regularly and gets regular updates, and you should also be prepared to encourage donors and non-donors alike to promote the campaign to their friends and family. The fact that crowdfunding requires only one page may make it seem super simple… and in a way, it is! They can generally be organized in a few days, especially since crowdfunding campaigns generally only require a single donation page. But good crowdfunding campaigns require near-constant maintenance, posts, updates, and general hype-building. Because it’s typically used for one-off fundraising projects, crowdfunding is a fundraising style that should be used sparingly. Using this method to raise money for a one-time expense is fine. Using it regularly to pay for programs or regular expenses can make you look unorganized and desperate. Be strategic about when and how you use it! An easy way to think of peer-to-peer fundraising as being like lots of little crowdfunding campaigns. Like crowdfunding, peer-to-peer campaigns generally have a set fundraising goal. Instead of nonprofits trying to recruit donors to meet that goal, they focus on recruiting individuals who will sign up to raise money on the organization’s behalf. Depending on the organization and the type of campaign they’re running, individuals may be divided into teams that work together to reach the fundraising goal. In a peer-to-peer campaign, the primary drivers of engagement and fundraising are the individuals who have volunteered to raise money. Instead of the nonprofit being responsible for building momentum and visibility, it’s responsible for giving their participating fundraisers the motivation, tools, and support they need to make the campaign successful. Unlike most crowdfunding campaigns, many peer-to-peer fundraisers culminate in an event that marks the end of an extended fundraising period. Common events are 5Ks, “fun runs,” bike races, dance-offs, etc. 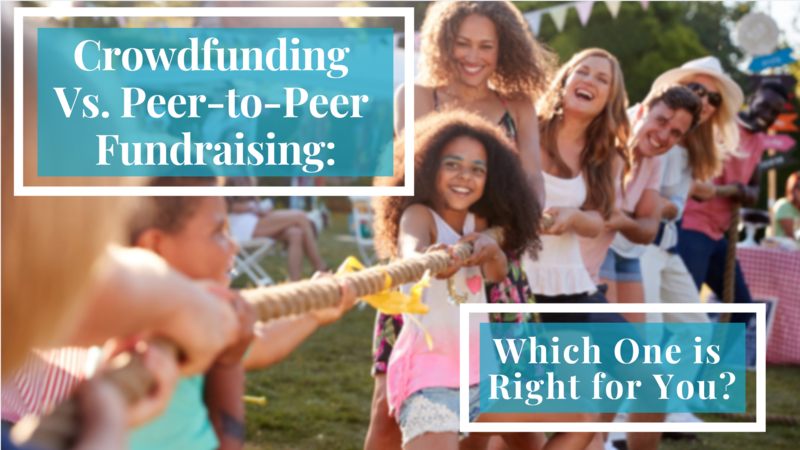 If you decide to launch a peer-to-peer fundraiser, expect to work hard to give your participants tools, encouragement, and ideas that will keep them invested in raising money. Just like crowdfunding, there are some situations in which peer-to-peer fundraising performs better than others. Here are the ones I’ve seen be most successful. Peer-to-peer fundraising is your best option if you’re looking to raise a substantial amount of money, find new donors, and build relationships with your most loyal supporters. Peer-to-peer events require more planning, execution time, and direct engagement with participants than crowdfunding campaigns, but the payoff can be incredible. If you have excellent donor retention methods in place, your peer-to-peer fundraiser can be one of the most powerful ways you find and engage new supporters. Anchoring a peer-to-peer fundraiser to a real-life experience like a 5k or other activity helps differentiate it from the one-off fundraising blitz tone of crowdfunding campaigns. Done well, peer-to-peer fundraisers can become an organization’s signature fundraising event that donors enjoy year after year. Peer-to-peer is also a great option if you’re looking to get a little creative in how your supporters engage with you. Nonprofits are getting creative with DIY fundraising, birthday campaigns, and individual fundraisers that are tied to important milestones in supporters’ lives. Many nonprofits are even exploring setting up peer-to-peer fundraising campaigns for board members! They’re using individual fundraising pages for board members, which makes it easy for board members to reach out to their friends, family, and colleagues online instead of making face-to-face asks. In summary, crowdfunding is when you set up a donation page and share it, asking your followers to donate and share it themselves. And in contrast, peer-to-peer fundraising is when your supporters each set up their own unique fundraising page for your nonprofit and share it with their network. Crowdfunding and peer-to-peer fundraising are both useful fundraising strategies for nonprofits. Each has its own merits and drawbacks, but both can be a lot of fun. Evaluating your goals, resources, and audience will help you decide which type of campaign is best for your individual situation! Abby Jarvis is a Blogger, Marketer, and Communications Coordinator for Qgiv, an online fundraising service provider. Qgiv offers industry-leading online giving and peer-to-peer fundraising tools for nonprofit, faith-based, and political organizations of all sizes. When she’s not working at Qgiv, Abby can usually be found writing for local magazines, catching up on her favourite blogs, or binge-watching sci-fi shows on Netflix.